My daughter is a photographer. This is her Monet-style photo of the garden pond. When the fish hear the backdoor slap, they dash to their meal-site, just in case! Beautiful pond. You’ve done a nice job with the plantings. Thanks, grumpajoe! The hard part is taking care of the goldfish in the house all winter. They are three years old and HUGE! I don’t know what your winters are like, but have yoou ever considered letting the fish winter in the pond? My philosophy on a pond is that it must be a natural eco-system. If I designed it correctly and built it properly, the fish live outside all year long. There are limits to that thinking especially if the pond freezes solid. 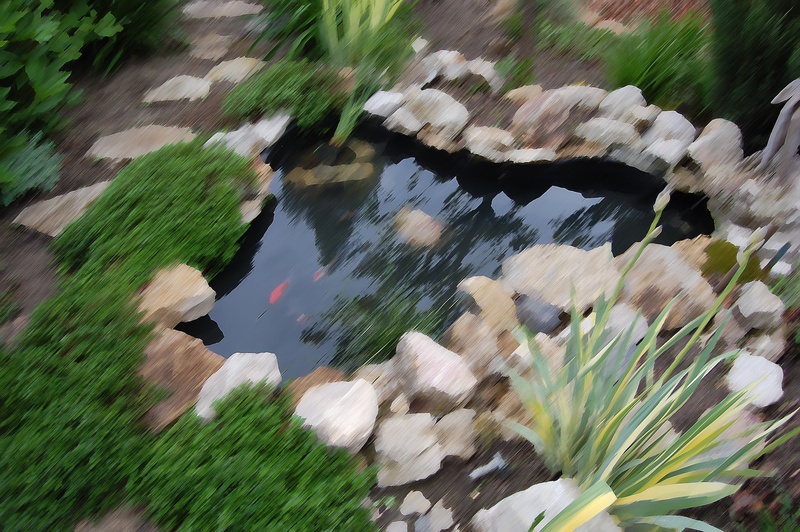 In my last life, I had a pond with fish that wintered for twelve years outdoors. Let me know what your winter is like. Small yard, small pond. It freezes solid in the very cold and long winter. I would have fishcicles! Your fish must have gotten very, very big in 12 years! My largest fish was a Koi. He was over eighteen inches long and weighed three to five pounds. The goldfish were smaller, but respectable at twelve inches. One day I witnessed a visit by a mink. I never saw a mink before. Then I saw him running from the pond with a large fish in his mouth. He kept coming back until the big ones were all gone. Another time, I saw a blue heron fly off with a very large fish in his beak. Occasionally, it was a Green Heron that stalked the perimeter and took four-inchers. The frogs kept the small fish in check. We never fed our fish on a schedule. We fed them for entertainment. That way they had to eat the larva and bugs from the water. My wife fed them often enough to get Big Al the Koi to eat out of her hand. In the winter, the surface froze over and the ice got to be six to ten inches deep. I kept an aerator running in the water to keep the surface open and to provide oxygen. My new pond is smaller than the last, i.e. less water volume. It won’t be so easy to keep the fish over the winter, although the few goldfish we dumped in last November survived one of the longest hardest winters we’ve had in ten years. Oy koi! Big guy. That dang mink. Guess he was hungry. I have been keeping my eye out for birds, but we are pretty far from anywhere Blue Herons might be living. It was a long winter – I lost three roses. I just came across this exceptionally beautiful and enchanting blog through fess up friday. The fairy houses and illustrations are so magical they remind me of my childhood. Thanks for visiting WriterReading! It is always good to be enchanted, especially when fairies are involved. It is nice to meet you.